This tutorial and video describes the overall structure and components of a CPM eBook Student Version. All eBook courses have the same general structure. The video represents the structure, but may not be the course ordered. Click on the video to watch an introduction. Additional components may be reviewed in the notes below it. 1. Logon. In the black bar, locate the Tour and Help menus. Tutorials/trouble shooting are located there. Note: Use Chrome, Safari, or Firefox using eBooks. Internet Explorer may or may not work depending on your version. 2. After logging on the first time, click the cover. 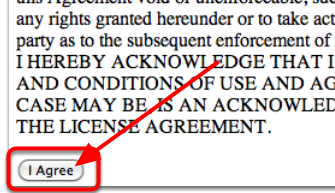 Then scroll down and agree to the terms. Your book will appear. 3. Hover over any of the lesson tabs to find problem numbers. 4. Every homework problem has a link to the Homework Help for that problem. 5. Search for Math Notes or other topics through the Index. 6. 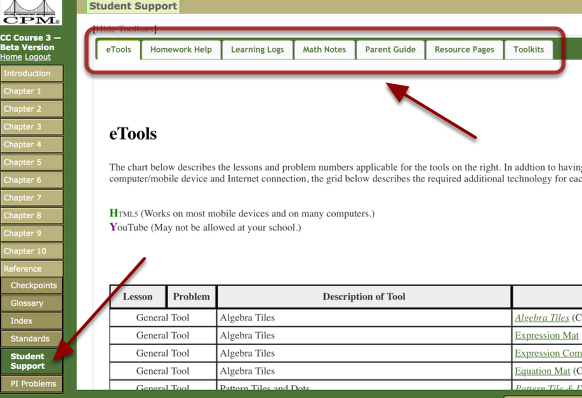 Find eTools, Resource Pages, and more through the Student Support tab. Next: Student Role: How do You Access a CPM eBook Using an Enrollment Pin?